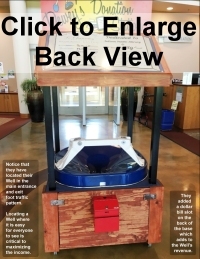 From Steve Divnick, Inventor and Manufacturer of Spiral Wishing Wells: This library page and program was developed to compliment the thousands of "Save Our Library" groups that are springing up all over the world. Many library budgets are hit hard by the digital age. Yet, there are significant numbers of people who love libraries and what they can do for their communities. It is our privilege to provide a product that generates so much money year-after-year and that puts big smiles on faces at the same time. With the grants we have secured, this is a great time to get a Well. ProjectKindness has stepped up in a big way with a Grant Fund to help libraries, providing $500 up front, described in the Pricing section below. If you love your library, you can give a one-time gift that keeps on giving...for many years to come! 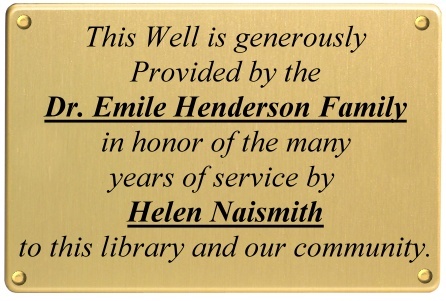 If desired, you can sponsor a Well "In honor of" or "In memory of" a person who has made a significant contribution to the library or the community, as illustrated in the accompanying photo. Spiral Wishing Wells have raised over $1 billion for libraries and other non-profit organizations throughout the world since 1985. Children and parents love to watch coins spin around in circles at eye-blurring speeds seeming to defy the laws of gravity as they descend the nearly vertical walls of the funnel until they finally disappear into the locked base. Even larger amounts can be raised at special promoted events where people are encouraged to bring all their loose change from home. The one day record is $40,979! We provide step-by-step strategies for events like this when a Well is first placed in the library and introduced to the community. Science Demonstrations: While Spiral Wishing Wells are earning money, they are also teaching science. 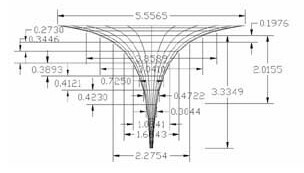 Be sure to check out our Student Guide* about tornados, whirlpools, funnel physics, planetary orbits, and nature’s gravity wells. Libraries can copy and use any of the pictures or descriptions on our website. You can loan your Well to science teachers, or invite them to bring their class to the library and conduct some of the funnel experiments. 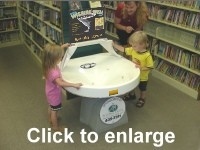 This is a great way to familiarize children with the library. *All links in this middle column open in new browser windows so you won't lose your place on this page. Better than an endowment fund: Because Wells generate so much money, they are better than an endowment fund that is tied to the stock market. And it is a bonus that they are also educational. This is an exceptional opportunity to make a lifetime gift to your local or school library. Not only will individuals or families eagerly provide the initial cost, local companies will provide additional revenue in the form of annual sponsorships with their name on a sign as illustrated in the accompanying photo. 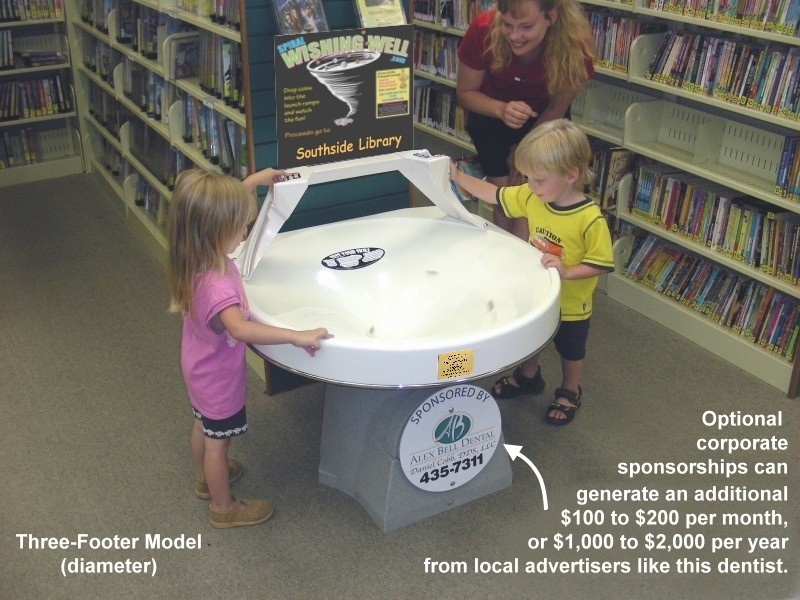 Being associated with a library and reading is a valuable community relations opportunity for companies, and they can’t get better advertising than having their “Sponsored by” logo and message on a Well in the library. We help libraries line up this additional annual revenue with a step-by-step strategy. See Sponsorships for more details. Click here to see a 1-page template that you can send or hand to friends and supporters inviting them to sponsor a Well. This is the FASTEST way to get an individual or family sponsor. Some libraries have gotten a sponsor within an hour of sending this out! 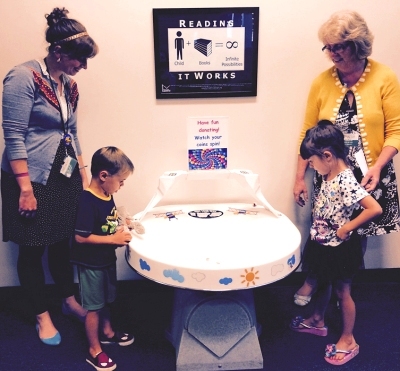 Our Wells are designed to be easily-movable within the library, and also to take to other locations. Some libraries and other locations build build their own bases and structures. You can see some great examples here. 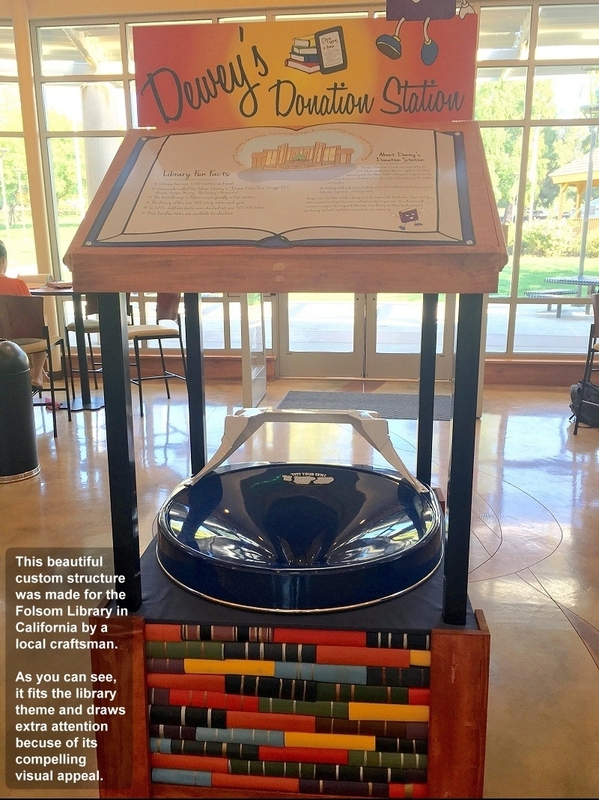 The Folsom Library in California has made a creative structure for their Spiral Wishing Well that simulates a bookshelf with an open book on the roof with a Dewey Decimal character. Click on the pictures to see this beautiful structure. We NEVER receive any splits or portion of the coin revenue. 100% of the funds raised go to the name or project listed on the sign above the Well (which is easy to change as needed...it just slips in under the plastic). The commercial-use cost of Two and Three-Footers is $1,995 plus $100 for color. Seven-Footers are $6,995 plus $200 for color, but too large for most libraries and not as portable. Most libraries get Three-Footers. The Project Kindness Grant Program is providing $500 toward the cost of Two and Three-Footers, and $1,000 for Seven-Footers for public libraries while their fund lasts. This is provided up front, so we only invoice you for $1,495 for white Wells, plus $100 for color, and $5,995 plus $200 for color. Click here to see colors. Of course, we provide ways for you to get that completely covered by sponsors. Sizes: Most libraries get Three-Footers. They are the most popular size, so we are able to pass the production savings on to the library resulting in the same cost as the Two-Footers. 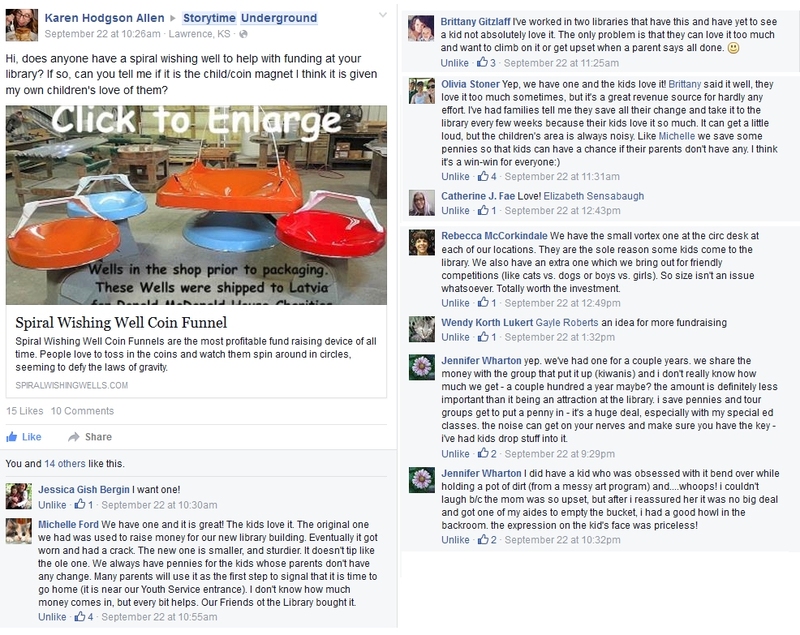 If the library doesn't have enough floor space, then the Two-Footers can raise just as much money as the large Wells. The coins race as fast in the larger Well, they just don't have as many of the slower initial revolutions. Quantities: The grants are typically limited to "1 per library". However, if you want more than one, as long as they have available funds and you have a good place to put additional Wells, or if you actively rent it out, they will extend the grants to multiple Wells. What is Included: Each Two and Three-Footer Well includes everything you need to put it into immediate service, including a generic sign into which you can insert the library name under the "Proceeds go to" phrase. It even comes with a padlock and 2 keys. See the FAQ's below for more details about the options. Place a Well in a nearby store or restaurant: As great as a Well is inside the library, also consider asking a local store or restaurant to host a Well for you. 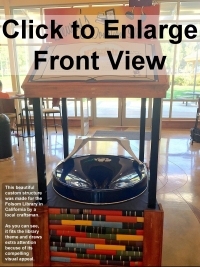 Not only will it generate a lot of money from the foot traffic in the store, it will serve as a "billboard" inviting people to come visit the library. Rental Options: You can supplement the income by renting your Well to local churches, schools, and charities. The standard rental rate is 50%. Rotating it out to other venues helps keep it fresh in the library, and it raises additional money and exposure. In fact, renting out a Well can be even more profitable than keeping it in your library. If desired, you can even provide brochures or coupons to be passed out by the borrowing church, school, or charity that promote the library. Also, we would love to be able to refer the rental inquiries we receive from your area to you. So if you choose to rent your Well to local charities, be sure to let us know. Click here for more rental details. We have all the items you need. 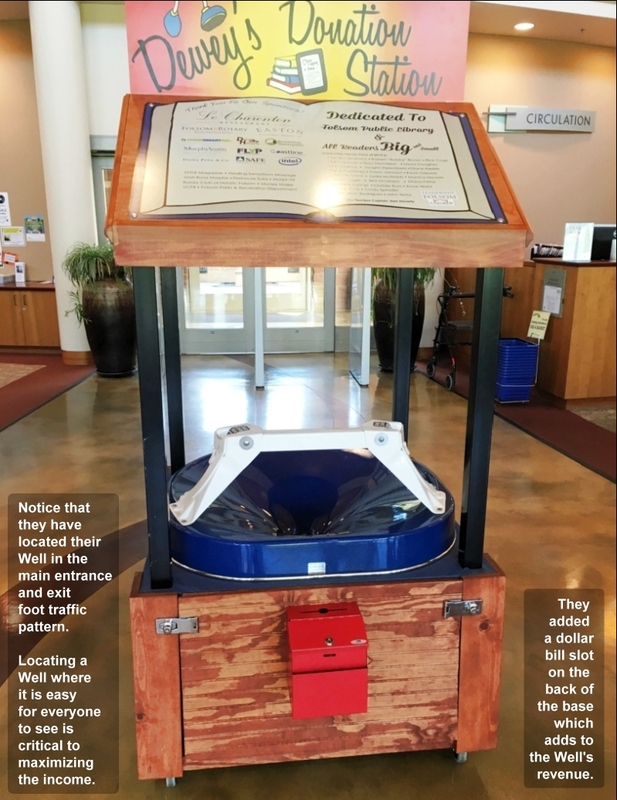 Mini-Well Toy Income: When people drop coins into the toy, they will want one for themselves since they make a great gift, and are fantastic for show-and-tell. You can take advantage of this by giving them away FREE for a $25 or greater donation and raise money that way. You can actually raise more money doing this than all of the coin revenue! You can read more about this here. Click here to see our Student Guide of educational elements. Feel free to copy and use freely. Click here to read more about public installations including how a single Well has generated over $1 million! 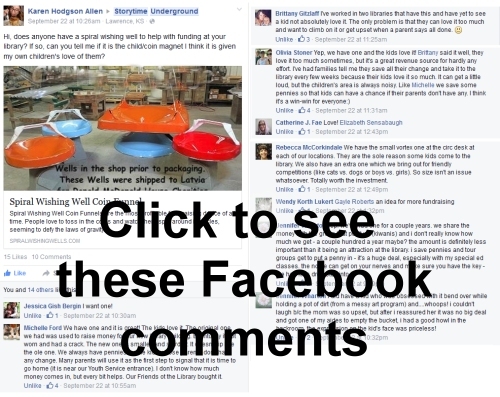 Click here to see a list of public institutions in the United States with Spiral Wishing Wells. Click here to see a list of international institutions with Wells. See the navigation menu for more details such as sizes, colors, security, promotions, and more. If you have any questions about sponsoring a Well for your library, please don't hesitate to contact us. Click here to inquire by email, or call Steve Divnick directly at 1-937-985-5863 (Eastern USA Time Zone, Same as New York). Ready to sponsor or order? If you are ready to order a Well, please click here to view and print the special library order form (PDF). We look forward to serving you and helping you provide a great way to help support your local library. 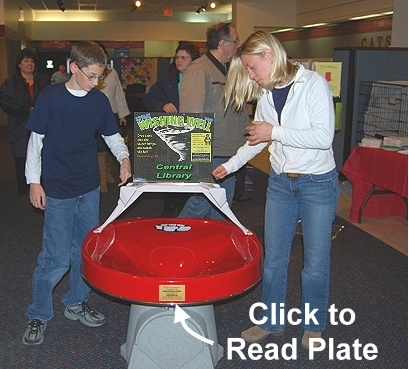 Q: Who is responsible for the sponsorship plate? Q: Who makes the corporate sponsorship sign? A: Again, we can make the sponsorship signs, but most companies have them made by their local own sign maker. We recommend a simple 12" diameter 1/8" thick plastic sign with common 4-color digital vinyl printing like the one shown here. The sponsorship signs are easily bolted to the door on the base. This allows them to be changed from year to year. Q: Are there any other requirements to qualify for the Project Kindness Grant? A: Libraries are pre-qualified. You do not need to fill out an application, and there are no reporting requirements. However, the order form must be copied on library or "friends of" letterhead, and the Well must be shipped directly to the library. A: Click here to see the shipping rates. If you are ready to place an order, please click here to see the PDF library order form. Otherwise, please let us know if you have any questions using the contact options in the "Contact Us" section above.